VSGC supports a number of Innovative Projects every year. These projects cover many disciplines and target both K-12 and Higher Education projects. University of Virginia professor Dr. Martin Wu was awarded funds for “Minion Detective: Detecting Microbes Around Us in Real-time.” Dr. Wu’s project involved the use of MinION nanopore DNA sequencing technology in university classes as well as in high school outreach programs. ODU’s Batten College of Engineering and Technology’s project “STEM Outreach Curriculum and Engagement Kits for ODU BCET” was used to develop STEM kits incorporating hands-on activities for students K-12. Princess Anne High School senior Nalin Ranjan’s proposal “Simulation of Inverse Compton Scattering and its Implications on the Scattered Linewidth and Importance to NASA” enabled him to present his research at the 2018 International Particle Accelerator Conference in Vancouver, Canada. Another Virginia Tech professor, Dr. Sheila Carter-Tod, developed “Enhancing Access Through Cyber Security: Teacher Professional Development Education and Dissemination” to provide cyber security training for teachers in 20 Virginia high schools. Virginia Tech provided students the experience of “IMAGINATION ‘18”, a summer camp sponsored by Virginia Tech’s Center for the Enhancement of Engineering Diversity (CEED). Dr. Li Yaohang, of ODU was awarded funding for “The Machine Learning & Data Science Summer Camp at ODU” for high school students interested in data science and machine learning. Dr. Margaret Saha’s project at The College of William and Mary “Engineering Biology for Space: Engaging Teachers and Students in the Promise of Synthetic Biology” helped to educate local K-12 students and teachers about the field of synthetic biology. Bonita Anthony at Old Dominion University received funds for “#HiddenNoMore with ODU Engineering,” a NASA partnered, on-campus event to attract and retain young women and underrepresented minorities in STEM careers. Dr. Charles Sukenik, a professor at Old Dominion University, submitted a project “Supporting STEM through Undergraduate Research Experiences in Physics” that allowed five students to participate in physics-related research over the summer semester. Dr. Christopher Goyne from the University of Virginia proposed “Continuity for the Virginia CubeSat Constellation Mission.” This provided five undergraduate students internships to continue work on the Virginia CubeSat Constellation project. Dr. Wu He and Dr. Chunseng Xin from Old Dominion University helped to create “Cybersecurity + Computer Programming,” a new technology camp for middle school students interested in computer programming and cybersecurity. 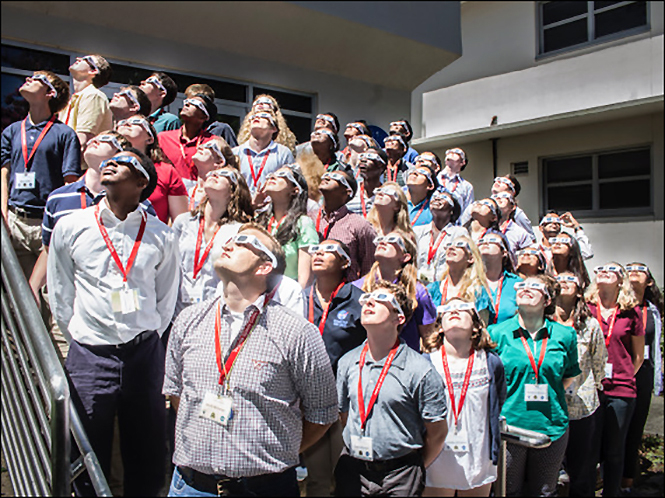 Dr. Edward Murphy of the University of Virginia was funded for “Solar Eclipse Workshops,” which provided a series of educational workshops for teachers. Over 200 teachers across the state of Virginia learned about the 2017 eclipse. Huseyin Sarper from Old Dominion University created a project titled “Descent Analysis of Model Rockets.” This project explored mathematical and numerical methods of model rocket descent data. The Science Museum of Virginia’s project “Cosmic Climate Cookbook” was funded in order to finalize production and distribution. The digital, audio-visual production on climate science and resiliency program is for K-12 audiences. Silvana Watson of Old Dominion University was awarded funding for “Scientific Argumentation in an Elementary Inclusion Classroom.” This five-day workshop focused on elementary students’ abilities to effectively use argumentation and explanatory writing in science. Dr. Thomas Allen, a professor in the Political Science and Geography Department at Old Dominion University, proposed a project titled “Unmanned Aerial Vehicles (UAVs) for Coastal Resources and Hazards.” This project allowed him to acquire and test commercial-off-the-shelf UAV technology for producing geospatial data. The Virginia Air and Space Center’s project “Empowering Students to Learn with Virginia Air & Space SMALLLab” project, allowed for 300 underprivileged and underrepresented students in Hampton Roads to experience the SMALLab (Situated Multimedia Arts Learning Lab) Learning Space.